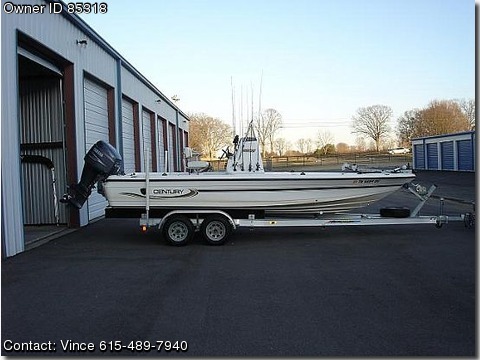 04 Century 2202 Bay Boat, 04 Yamaha 200HPDI with SS prop and jackplate, 04 Performance Alum trailer with brakes and spare. Mguide Lazer 24v trolling motor with fresh batteries and onboard charger system. garmin and bottom line electronics gps/sonar. tons of storage and 2 livewells and bimini top. excellent condition, 180 total hours, warranty on hull thru 2014 and motor thru March 09. all original manuals and maintenance log, always garaged or on covered lift. Never in salt but ready to fish anywhere. Perfect rig for stripers, Bass or other fresh or salt inshore species.